NY: Sony Music Entertainment, Inc, 2003. 3-DVD set in box; disc 1. 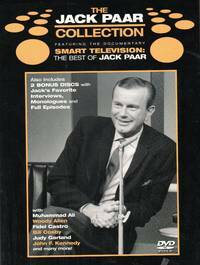 Jack Paar : smart television: the best of Jack Paar; disc 2. Complete interviews and Jack's favorite monologues: Interviews with Richard Nixon, Cassius Clay/Liberace, Billy Graham, Barry Goldwater, Robert Kennedy ; monologues from 1962-1965; disc 3. Complete episodes: Nov.16, 1962, with Bette Davis, Jonathan Winters, Gisele MacKenzie ; May 8, 1964, with Richard Burton, Bill Cosby, Arthur Godfrey ; Dec. 11, 1963, with Judy Garland, Robert Morley, Randolph Churchill. DVD. Near Fine/Boxed Set. Illus. by DVD. Dvd. Virginia City, MT: Privately Printed, 1967. 5th printing; 96 clean, unmarked pages. Signed by Author. Paperback. Very Good. Illus. by B/W Illus. 4 Vo; .5 Pounds. London: Illustrated London News, 1854. 1/2 page w/story & an engraved portrait of the Viceroy. Unbound. Very Good. Illus. by Artist Unattributed. 11'' x 16''. NY: McGraw-Hill, 1984. 512 clean, unmarked pages/notes, index, and bibliography. dj w/lite wear only. Hardcover. Near Fine/Very Good. 8 vo. NY: Newcomen Society, 1968. stapled wraps 24 pages. First Edition. Soft Cover. Very Good. Illus. by Frontis. 8 vo. 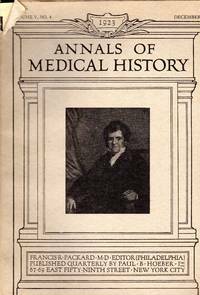 NY: Paul B. Hoeber, 1940. pp.451-548+index & ads; includes items by/abou: MEDICINE; Walter R. Steiner (Dr. Pierre-Charles-Alexander Louis), Paul E. Bechet (Jean Nicholas Corvisart), George W. Jones (Hodgkin's Disease), William G. Lennox (Antonius Guainerius on Epilepsy, Whitfield J. Bell, JR. (Dr. James Smith and the Public Encouragement for Vaccination for Smallpox), Harry Friedenwald (Jews and the University of Montpellier), Philip D. Jordan (Pt. 1, Naval Surgeon in Paris), Editorial (weather in Colonial America), Memroials to Jane Todd Crawford & Dr. Crawford W. Long, Book Reviews, Etc. 1st. Paperback. Very Good. Illus. by B/W; James Jackson, Jr. On Cover. 4 vo. Journal. 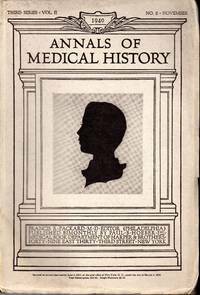 NY: Paul B. Hoeber, 1941. pp.461-545+index & ads; includes items by/about: MEDICINE; William Shainline Middleton (Medicine at Valley Forge, Revolutionary War), M. Pierce Rucker (Benjamin Rush, Obstetrician), Frances Tomlinson Gardner (Pedro Prat. 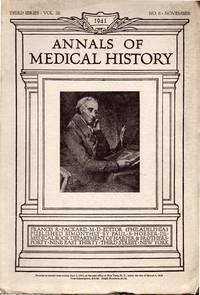 Surgeon of the Spanish Conquest), Iago Galdston (Humanism and Public Health), George E. Gask (the School Of Medicine in Rome, Italy), Library of the Late S. Weir Mitchell, Hygiene Among the Ancient Egyptians, Book Reviews, Etc. 1st. Paperback. Very Good. Illus. by B/W; Benjamin Rush on Cover. 4 vo. Journal. NY: George H. Doran Company, 1927. 1st printing; dj w/1" piece missing, closed tear, in mylar; orange c w/red titles; 314 clean, unmarked pages. . 1st. Hardcover. Good/No Jacket. 12 vo. London: Longmans, 1960. First British Edition; dj w/lite chipping, unclipped price; newsclippings laid in; ownr's name; 376 clean, unmarked pages. 1st. Hardcover. Very Good/Very Good. 8 vo. NY: Dial Press, 1950. 192 clean, unmarked pages; dj w/unclipped price, lite chipping; First Edition, First Printing. 1st. Hard Cover. Very Good/Very Good. Illus. by B/W Photos. 8 vo. NY: Doubleday, Doran & Co; Crime Club , 1931. 1st printing; dj w/1/2" piece missing, in mylar; 294 clean, unmarked pages. owner's name. 1st. Hardcover. Very Good/Very Good. 12 vo. 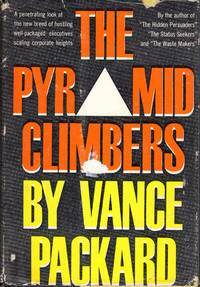 NY: David McKay Co, 1960. dj w/lite chipping, unclipped price; ownr's name; 340 clean, unmarked pages. 3rd Printing. Hardcover. Very Good/Very Good. 8vo. NY: Charles Scribner's Sons, 1992. First Edition, First Printing; 432 clean, unmarked pages; dj w/unclipped price; The story of the five nation states, Switzerland, Sweden, Spain, Portugal and the Republic of Ireland, who preserved their sovereignty and protected their populations from devestation during the course of the Second World War. . 1st. Hardcover. Near Fine/Near Fine. 8 vo. NY: Doubleday, Doran & Co; Crime Club , 1931. black c w/orange titles; front flyleaf missing; 303 clean, unmarked pages. . Hardcover. Good/No Jacket. 12 vo. 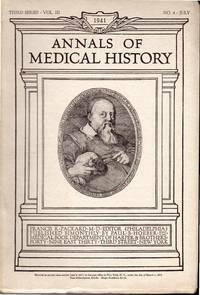 NY: Paul B. Hoeber, 1923. pp.291-416+index; includes items by/about: MEDICINE; Petrus Hispanus, Pipe John Xxi (portrait and Article By David Riesman), Delancy Rochester (Richard Bright in Guy's Hospital), Norman B. Gwyn (William Osler, toronto School of Medicine), J. W. Courtney (Moliere and the Faculty), F.L. 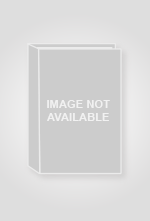 Pleadwell (Edward Cutbush, M.D. ), Dan Collier Elkin (Transylania School and Oliver Perry Hill), I. Kobro (three Medican Pioneers in Norway: Christian Horrebow Homan, Sr., Christian Horrebow Homan, Jr. & Christian Holst Hartwig) Letters, Book Reviews, Etc. 1st. Paperback. Very Good. Illus. by B/W; Richard Bright on Cover. 4 vo. Journal. 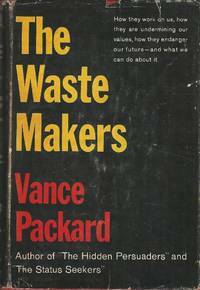 NY: McGraw Hill, 1962. dj w/lite wear, unclipped price; owner's name neatly inked out on flylear; 337 clean, unmarked pages; 3rd Printing. Hardcover. Very Good/Very Good. 8 vo. 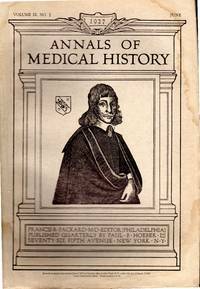 NY: Paul B. Hoeber, 1927. pp.111-204; includes items by/about: MEDICINE; E.B. Krumbhaar (Stigmata of St. Francis of Assisi), R.T. Williamson (Peter Mere Latham), John C. Brougher (William Shapey), Louis J. Bragman (Rene Theophile Hyacinthe Laennec and Nicholas Culpepper as Depicted in Rudyard Kipling), Joseph Walsh (Galen's Studies at the Alexandrian School) Jonathan Wright (evolution of Aristotle Thought), Stephen D'Irsay (Black Death of 1348-1349), Le Roy Crummer (Copho's "Anatomia Porci"), Charles W. Burr (Some Medical Words in Samuel Johnson's Dictionary), Frederick Eberson (Goldoni, Clinical Dramatist), Benjamin Waterhouse, American Pioneer (editorial), Book Reviews, Etc' slight, lite, old marginal dampstain on a couple of pages. 1st. Paperback. Very Good. Illus. by B/W; Nicholas Culpepper on Cover. 4 vo. Journal. 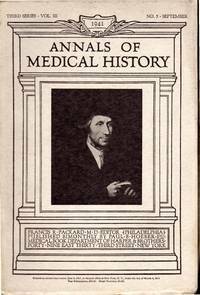 NY: Paul B. Hoeber, 1941. pp.363-460+ ads; includes items by/about: MEDICINE; O.H. Perry Pepper (David Bylon and Denegue), Gordon M. Bruce (Penal Blinding in the Middle Ages), William G. Lennox (Bernard of Gordon on Epilepsy), Edward F. McLaughlin (The Guilds and Medicine), Reginald Fox (Pt. 2, Surprizing Career of Peter La Terriere), Louis H. Roddis (Pts 6-8; Short History of Nautical Medicine); Siamese Twins, John Morgan's Journal, Book Reviews, Etc. 1st. Paperback. Very Good. Illus. by B/W; Thomas Linacre on Cover. 4 vo. Journal. 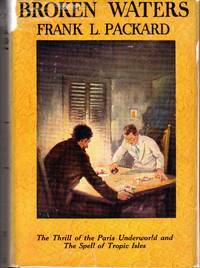 NY: Paul B. Hoeber, 1941. pp.265-362+ ads; includes items by/about: MEDICINE; Peter La Terriere (frontis), Reginald Fitz (surprizing Career o Pierre La terriere), R.L. deC H. Saunders (Gunner with the Silver Mask), Thomas Gibson (Iconography of Sir Theodore Turquet De Mayerne, Etc. ), William Dosite Postell (erasmus Darwin Fenner Medical literarture in Louisiana), James Eckman (Alexander J. Stone), Louis H. Roddis (short History of Nautical Medicine, Pt. V); Brit8ish Physician and Government Agent in the Revolution, Harofe Haivri, Hebrew Medical Journal, Book Reviews, Etc. 1st. Paperback. Very Good. Illus. by B/W; Theodore Turquet De Mayerne on Cover. 4 vo. Journal. Racine, WI: Whitman Publishing Co, 1929. 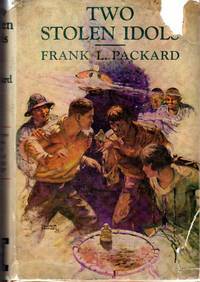 First Edition, First Printing; pictorial cover; some chipping of spine, lite wear at edges; unpaginated; all pictures intact; in mylar protective wraps. 1st. Hardcover. Very Good/No Jacket as Issued. Illus. by Color Photos. 8 Vo; 1 Pound.